Colby Deer learned to water ski on the lakes of Ohio and Michigan as a very young child— in fact, as soon as he could stand. Born and raised in the industrial town of Springfield, he says Ohio was a productive and a nice place to grow up, especially during that era when there was a large population who worked at all the factories that were still operating. In his time, International Harvester was making cars and trucks there. Throughout his school years, he played a lot of basketball; sports were always his interest. Eventually, he learned golf as a way to get out into nature. His experience taught him that, at least in his patch of Ohio, team sports were highly competitive and everyone participated in them. It was just what you did. Colby graduated from high school in 1975, having no idea what he wanted to do, just knowing that he loved sports. He enrolled at CU Boulder. “When I came out here, the weather was incredible and I wanted to learn how to ski better,” he says, adding that it was an easy transition for him to go from water skiing to snow skiing. His mother had moved her psychology clinic to Vail in 1977 while he was still at CU, which, he smiles, was fabulous since he could drive up from Boulder and ski. “I started telemark skiing that year,” discovering Crested Butte in 1978 when one of his friends, Chris Veit, moved here. Colby liked the town so much that he decided to move here too for the summer of ‘78 while on break from his classes. He remembers that there were essentially no jobs in the still sleepy off-season of summers back then. Colby graduated from CU in 1979 with BA in environmental science. He says, “I was always into biology, geography and saving the earth,” a passion he still carries with him. That same year, he moved to Vail, working as a laborer and after three months on the job, he was able to follow his dream and was hired as an environmental consultant. Colby then helped to build the Beaver Creek ski area, monitoring the water quality as they did massive excavations to create their base area. Colby moved back in mid-winter of 1980-81 and got a job with Crested Butte Mountain Resort, telemark guiding the outer limits, which, back then, were the Banana and Headwall. He taught both telemark and classic techniques. “That year we won the Trucker Cup,” he says of his team, which included Rick Borkovec, Dean Kooiman, and Chris Veit. When Crested Butte Mountain Resort dropped its Nordic program in 1986, Colby says it was the impetus that created the Nordic Council, started by Jan Runge, Brian Dale, Jerry Deverall, Dan Ewert, and Keith Austin. Colby joined them in 1988 and became involved with the development of the Nordic system. “When the Trappers [subdivision] deal closed, the Nordic system was in shambles. We lost the trails because we had no easements and no money. We didn’t have anything, so we hired Kathy Frank as our director and she acquired all the necessary easements and got the system going with marginal equipment. I was president of the Nordic Council for four years and our main goal was to get the trails connected from town to Riverland and Mt. Crested Butte so people could ski to work or school. Also, to get a snow cat. Colby worked construction in the summers and when the snow fell and the lifts cranked up, he was a ski instructor and snowmaker for CBMR from 1986 to 1992. By 1989, Colby had started his own company, Deer Construction, building 26 homes between 1989 and 1992. “In 2002, I decided to move the family to Ostersund, Sweden,” says Deer. Their two children were both born in Gunnison: daughter Sofia in 1994 and Axel, their son arrived in 1997. Colby sealed his first pro contract, a sponsorship by Dakine in 2013. 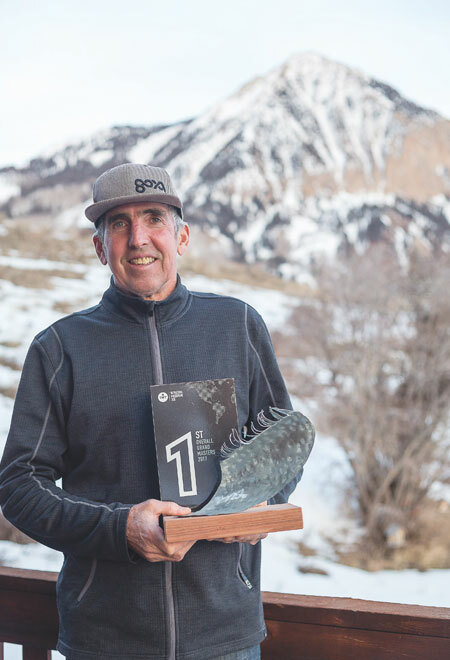 The following year he continued to compete, coming in second at Gold Beach and winning the overall tour for the American Windsurf Tour Grand Master in 2014. His love of the sport and the competitions took him from Gold Beach to Hawaii, Baja, Santa Cruz, Punta San Carlos, and Maui to Cape Hatteras and Morocco. This year, the first leg of the International Windsurf Tour starts in Morocco on March 28, so he’ll be there, prepping for 24 days. “The comp window is 14 days because it’s the world cup,” he explains. “It’s a really big event this year. Berit has definitely been there to support all my windsurfing. Now that we’re empty nesters I can spend more time focusing on my sport.” He’ll be in Oregon June 7 through June 10, Baja in mid-August, and Maui, October 28.